India International Science Festival has started with huge participation of scientists, students and experts from across the country and abroad. 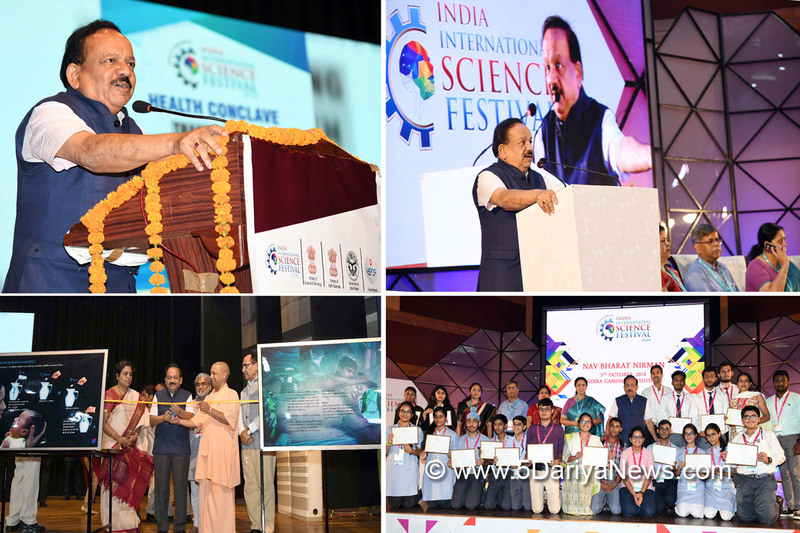 Union Minister of Science &Technology, Dr. Harsh Vardhan today inaugurated few of the major events at the four day science festival in Lucknow including Young Scientists’ Conference, Global Indian Science & Technology Stakeholders’ Meet (GIST) and the Mega Science, Technology & Industry Expo.IISF-2018 with its focal theme “Science for Transformation” is having 23 special events in its 4th edition.During an interaction with young students’ at the Science village ,which is linked with the Pradhan ManthriSansadAdarsh Gram Yojana to reach out to the rural masses and propagate science and for seeking scientific solutions to the diverse challenges facing our society, particularly rural India the Union Minister said that “I truly believe that our young scientists will play animportant role in realizing the dreamof making a New India” said Dr.Vardhan during an interaction with young students’ at the Science village. “Nav Bharat Nirman”/Creation of new India a concept focused on the innovative methods and solutions to overcome India’s historical and social disadvantages along with problems created in the 21st century , saw innovators getting an opportunity to expose their ideas and share the knowledge among them and coming up with the innovative and creative solutions through exploring the emerging fields of science and technology. Distributing prizes at the event Dr.Vardhan said that today is the age of idea economy and the most important coefficient today is innovation coefficient and the government is fully committed towards supporting innovation.IISF is conceivably the biggest platform in India that brings together students, researchers, artists and general public to celebrate our nation’s achievements in science and technology. It is a medium to encourage the young minds towards the field of science and to promote the networking of stakeholders working towards the propagation of science. Through this festival, the largest of its kind in the country and in this region, it is expected that the message of excitement of Science and scientific temper will be spread to the students and will be inspiring for the youth. All stakeholders have assembled to collectively work towards “Vigyan se Vikas”- contributing to the Making of a New India.Major attention in coming days are two World record attempts in IISF 2018, one of which is a World Record attempt to “isolate DNA” by 500 students from class 8th to 10th standard. President of India Shri Ram NathKovind will formally inaugurate the mega science festival tomorrow.